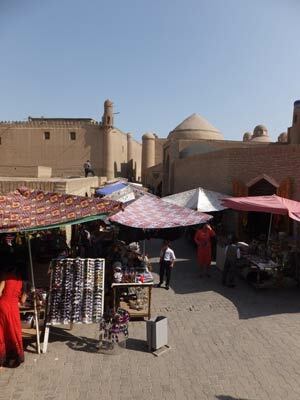 3 Sept: Leaving beautiful Bukhara behind with a bit of a sigh. I would have liked a bit more time to explore and to SHOP. So many carpets, forged knives, incredible hand embroidery, silk and more silk, but it is time to go, and we head for the hills. After the green fields full of melon, tomato, cotton, corn and the many apple orchards around Bukhara, the Kizilkum (Red Sand) desert begins again. Today we are travelling north east and into the low mountains. On the way, we make a stop at Chashma Spring, sacred to the Zoroastrians and to many locals for its crystalline water known to cure all ills. We see the locals coming with plastic bottles to fill and take home. The spring is interesting because it is very like our Yucatecan cenotes, and is also said to have been formed by an asteroid fracturing the earth’s crust, creating underground rivers. And here I thought that only happened in the Yucatan! Above the spring, on the hill, we are shown the remains of an adobe fortress believed to have been built by Alexander the Great around 330 B.C. About 4pm, finally, we arrive at the yurt camp. 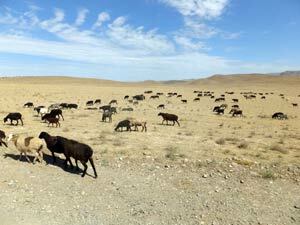 Sadly, there are now no nomads in Uzbekistan. So the yurts are not exactly authentic… a little bit kitsch, but interesting to see. 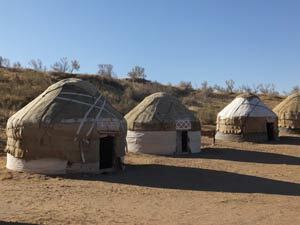 The Uzbeks have always been a settled farming and trading peoples, but the Kyrgyz, who were once nomadic, were “encouraged” to settle during the years the area was part of the Soviet Union. They still live here, but now in scattered farms, and their huge herds of black/brown goats and sheep graze far and wide on the brown grass of the hills. We are four “girls” to a yurt. Our yurt is quite roomy and comfortable inside, and pretty, too! I love looking up at the many wood spokes supporting our dumpy felt Hobbit house. Next on the agenda, a camel ride on a beautiful furry dromedary with eyelashes to die for. As it turns out, a camel ride is a bit like a pony ride. We are led, five at a time, around a short loop of trail… that was quite enough! It’s been a long time since I went for a pony ride! Right afterwards, we climb up on the highest dune to watch the sun set. My fellow travelers are all keen photographers, and it WAS a pretty sunset. After dark and after dinner, we listen to a singer who accompanies himself on a sort of fish-skin guitar with dirgelike doleful music. It is not hard to imagine words, especially after the free bottles of rather crude vodka which accompanied dinner. “It is so cold and the snow is so deep….the camel has died and now we will have to eat the baby camel…now how will we collect firewood?…I hate living in a yurt.” Ah, yes… vodka is great for the imagination. 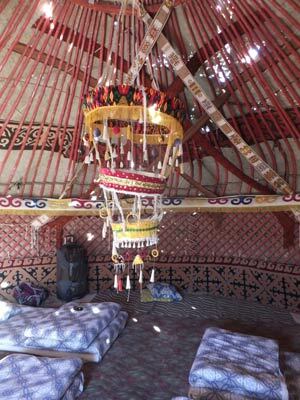 4 Sept: I slept very well in the yurt. It was a perfect temperature… not too hot, not too cold. A few of the group are beginning to have wobbly innards, but for me, so far so good. 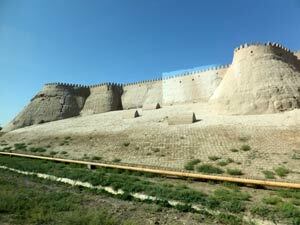 Today, we go to Samarkhand, which is about a 5 hour drive. After the bus ride, we get to Samarkhand around 12:30, and start a city tour at 2 pm. Samarkhand has truly amazing historic monuments which seem scattered over a large area until you get the hang of the route. The second day they were quite walkable actually, especially because our hotel is just across the street from the Registan complex. The first stop on our tour was the burial place of Timur (Tamerlane), the great ruler of Samarkhand. We couldn’t resist watching while a group of local ladies posed for their photo op…but surprise! They were just as fascinated by us, and made us join them for the encore photo! 6 Sept: We got for a morning tour, this time around the Registan. These are three of possibly the most beautiful mosques (also known as madrassahs) in the world. 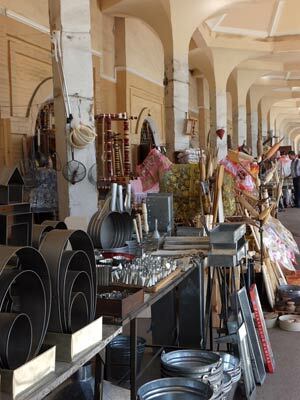 One is still in use as a Friday Mosque and the others are the domain of the ubiquitous artisans, including miniaturists, antique sellers, carpets sellers, sellers of embroidery, and all of it of very high quality. Next we see the Bibi Hanum mosque and after that, we get a free afternoon to wander around. On this afternoon our group split up, the majority going back to Tashkent a night early, to go on to Kyrgyzstan tomorrow. Six of us stayed on together for a last day in Samarkhand. 7 Sept: I apparently ate something which didn’t agree with me on my last night in Samarkhand, and spent the day stretched out on my bed drinking green tea, reading a bit, and sleeping. It was a free day and not being up to shopping probably saved me from myself. At 4 PM, we boarded the very impressive high speed train to Tashkent. The train is spiffy, new and Spanish-made, with pretty air hostesses and a small snack served on the 2.5 hour 200 kph run. We were met at the station and chauffered back to our group starting point, the Hotel Uzbekistan for one last night of luxury. The luxury included a king size bed, white duvet, and a 15th floor view over Tashkent. I was finally feeling better, but still ready to crawl between the snowy sheets for an early night. Tomorrow I will be starting my solo trip to Ferghana Valley. 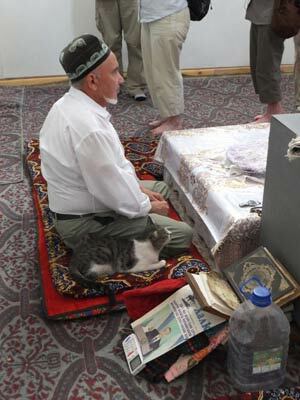 9 Sept: It isn’t that they don’t have a Sept 8th in Uzbekistan. I have lost a day somewhere. It is easy to do! On September 9, Hamid, my driver, arrives to pick me up. It’s a nice change to be able to ask all the questions you can ask because there are not 17 of you. So many questions about life here! And of course, I have a lot of questions about real estate. Although the government owns all the land, home ownership rates are very high. On the breakup of the Soviet system, everyone got the chance to buy their home for a very low price (a few thousand dollars) and low interest loans are available. Hamid is also curious to know about how WE do things… how I manage rentals, the buying process, costs of real estate. It turns out that some things are universal. We talk all during the drive to Ferghana, which is the center of Uzbekistan’s silk and cotton production area and a very odd shape. Ferghana is a sliver of land poking north east from Tashkent between Kazakhstan and Kyrgystan. It crosses Uzbekistan’s highest major mountain range through an arid pass with a lot of construction going on. The road is being improved (it needs it!) and a new railway section is being built with the help of China and is almost complete. The area is dry and dusty, but in winter it is often snowed in by the severe weather which blows down from Siberia for around 40 days of the year. It makes me glad I live in the Yucatan! And here I will leave you. Stay tuned for the next blog post, when I will take you to the potteries, spend a night in Ferghana and see silk from beginning to end at a Yodgorlik traditional factory. Posted: October 8th, 2014 under Global Travels.